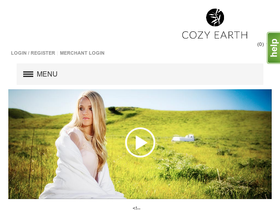 Cozy Earth, online at cozyearth.com, is the destination for organic bedding and more. Cozy Earth carries bamboo comforters, silk comforters, dual silk comforters, bamboo duvet covers, silk pillows, bamboo pillow cases, dual bamboo comforters, bamboo sheets, bamboo blankets, and bamboo crib sheets. Stop by RetailSteal.com for the latest Cozy Earth coupon codes, Cozy Earth discount codes, and Cozy Earth promo codes. Cozy Earth offers shipping promos that change often. Visit RetailSteal.com for the latest Cozy Earth shipping specials. Buy a bundle and save up to 25% with package deals from Cozy Earth. Act now and enjoy 50% off a duvet cover with the purchase of a comforter from Cozy Earth. Save 10% on all comforters at Cozy Earth. Enjoy free shipping on all orders at Cozy Earth. Shop bamboo blankets for as low as $89 at Cozy Earth. Shop bamboo sheet sets for as low as $259 at Cozy Earth. Enjoy exclusive promos with email sign up at Cozy Earth.